This one had a different look to it. It had been a rather blah return to the Digital World, with a plodding introduction to the Dark Masters and followed by an episode remarkable only for the level of stupidity exhibited by the digidestined. Their ensuing escape from MetalSeadramon required more wits than firepower and therefore throws a few surprises our way. It lacks the recurring elements that propel the Dark Masters arc, but it's an appreciated diversion nonetheless. When we last left our heroes, they attempted to evade a giant metal sea monster by going into the sea, which, to nobody's surprise, proved disastrous. Whamon comes to the rescue and takes them to safety... further out to sea. They stop to rest at a lagoon, for some reason never landing on the nearby atoll. 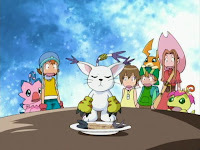 Instead, they stay on the whale's back and dine on fish caught by Gatomon and Palmon. 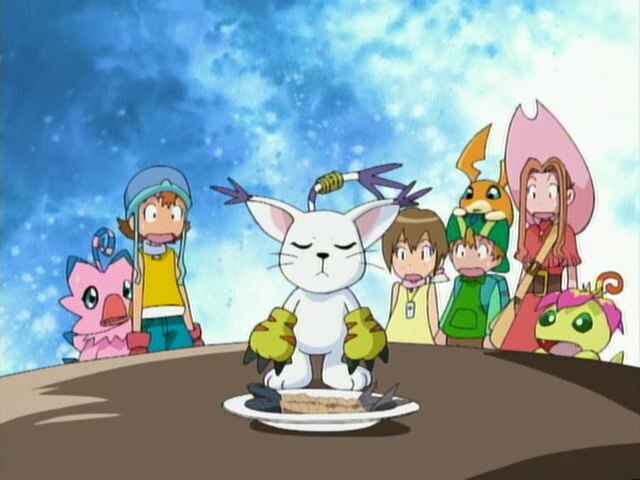 Gatomon singing the blues to Matt's harmonica while preparing sushi was amusing... but also very random. The majority of the episode seems to be an homage to submarine movies. 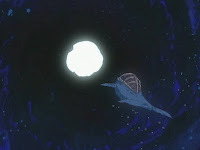 Whamon takes them into the depths of the ocean to avoid the sharp ears and eyes of the Divermon serving MetalSeadramon. All sorts of submarine cliches are pulled out here: they have to deal with the confined space and increasing water pressure, run silent to stay out of earshot, dive far enough under to crush the Divermons' tanks, use Kari's whistle to improvise sonar navigation and pass a narrow undersea cave while being chased. It's no wonder they enjoy the sun and fresh air once they get out... even when MetalSeadramon pops out moments later. MetalSeadramon's a hard villain to characterize. On one hand, he seems hot-tempered and eager to go on a tear for the hell of it. On the other hand, he takes a pretty professional approach with his minions. He takes it personally when someone like Whamon stands against him. He utilized and paid for Scorpiomon's services, but stepped in when it was clear the job wasn't getting done. Then he mobilizes the Divermon and keeps them on the ball, again waiting until the kids are spotted before taking matters into his own hands. Given that there's an entire ocean to hide in, the fact that he can find and close in on the digidestined shows some degree of efficiency not found in a typical hotheaded bad guy. The episode ends with a face-off between him and WarGreymon, the first battle where Agumon goes straight to Mega. Earlier in the episode, Izzy said WarGreymon has an advantage against -dramon types, but it doesn't show here. WarGreymon damn near gets eaten, then damn near drowns. Zudomon has to jump in again to save him, making for quite the busy day for him. Very quietly, Garurumon, Birdramon and Kabuterimon airlift the kids to safety, while Whamon is still sticking around and helping out. Not that he'll be involved in the battle; he's done enough already. In a nice attention to detail, the real world can still be seen in the sky. When Whamon's speeding through the ocean early on, there's a nice shot of India in the distance. Gomamon finds out through his fish friends that the Divermon are nearby, and Whamon says they're 200 miles away... which is apparently too close for comfort. Damn, how fast can those things swim? I'm not sure if it's brilliant or totally far-fetched that Izzy could hack into Whamon's circuitry to allow his laptop to display exactly what Whamon is seeing. I understand that they're digital creatures, but still... that kind of thing can't be plug and play, can it? When it gets to the point at the end where they have to stand and fight MetalSeadramon, Joe gets chewed out for wanting to run. First off, it's a bit weird that Joe's still showing cowardice, seeing as he's already proved himself a goddamn action hero. Second, given that Zudomon's already had a full battle that day, can you blame Joe for wanting to sit this one out? "Earlier in the episode, Izzy said WarGreymon has an advantage against -dramon types, but it doesn't show here. 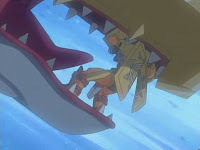 WarGreymon damn near gets eaten, then damn near drowns." I've seen it suggested online that MetalSeadramon's advantage over WarGreymon here was due to his being a Data-type, whereas WarGreymon is a Vaccine-type. Loosely speaking, the three attributes of Data, Virus, and Vaccine have a rough rock-paper-scissors advantage, with Virus trumping Data, Vaccine trumping Virus, and Data trumping Vaccine. I'm not sure how reliable that theory is, since there are plenty of counterexamples if you look around - for starters, plenty of Virus types like Myotismon enjoy easy victories over Vaccine Digimon - and I kind of wish the series capitalized on it a bit more. If I recall correctly; the Rock Paper Scissors thing with the Digimon types was in the card game (where the Digimon have 3 attacks each and the opponents type determines what attack is used). I guess that that theory originated from there?